Ukrainian musical breakthrough KAZKA band starts its first world tour, including cities in Europe and North America! KAZKA is the Ukrainian sensation; discovery of the year. 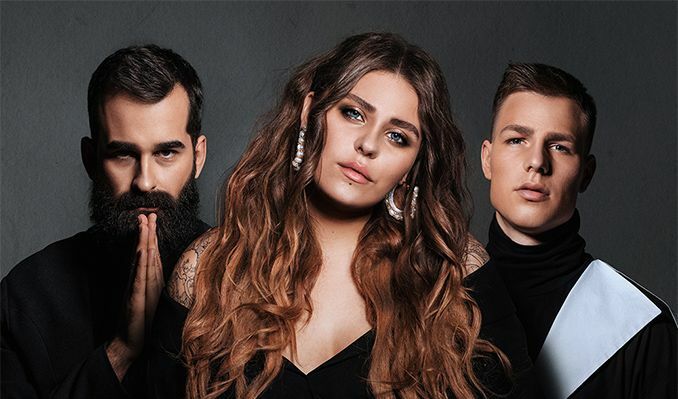 This talented band is the first Ukrainian-speaking group that got into the TOP 10 Global Shazam; the top performer among national artists and TOP 100 best clips on YouTube. Like a bright meteorite, the band KAZKA burst onto the music scene and immediately conquered everyone with their unique songs and incredible voices. KAZKA is the Number 1 musical band in Ukraine, Belarus, Bulgaria, Russia, Kazakhstan and other countries. The success of this group is owing to the unique voice of singer Sasha, the brilliance of pipe player Dmitry, and the mastery of the multi-instrumentalist Nikita. KAZKA is the definition of new Ukrainian music. Music of KAZKA band is a unique pop with elements of electro-folk performed in Ukrainian. The debut of the album KARMA consists of ten sensual songs about love, disappointment, hope and dreams. The main hit “PLAKALA” has got over 120 million views on YouTube and leading charts in Ukraine, Latvia, Bulgaria, Armenia, Kazakhstan, Uzbekistan, Belarus, Colombia, Russia and other countries. Together with the solo singer Alexandra, keyboard player Nikita, wind instrument master Dmitry tour will be joined by virtuoso drummer Yevgeny, and a trio of chorus girls Darina, Yarina and Vasilina.